First Line: When you first disappeared, your mother warned me that finding out exactly what had happened to you would be worse than never knowing. Claire is the trophy wife of an Atlanta millionaire. Lydia is a single mother who's dating an ex-con and struggling to make ends meet. Twenty years ago, Claire and Lydia's teenage sister Julia vanished without a trace. When Claire's husband is killed, that "Julia wound" they've never really recovered from is ripped open once again. What could possibly link the disappearance of a teenage girl with the murder of a middle-aged man? Claire and Lydia have formed an uneasy truce to find the truth for themselves. 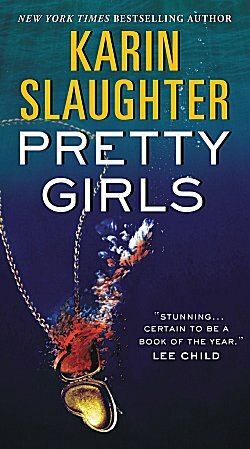 This is the first book written by Karin Slaughter that I've read, and I have to admit that I was a bit underwhelmed. This is a story with occasional chapters from the point of view of Sam, a father grieving over the loss of his daughter Julia. The family dynamics are the best part of the book. Readers witness a tragedy and the implosion of a family, then watch as the two remaining sisters form an alliance to uncover the truth. But as good as the story of those family dynamics is, Pretty Girls suffers from "too much middle" that slowed down the book's pace and bogged down the story. Perhaps too much exposition is why I thought the bad guy was too over the top, and why I wasn't really surprised by any of the revelations. I can see how some readers would find this book too violent and misogynistic, but those elements really didn't bother me that much. What bothered me was knowing that a first-rate thriller was buried beneath way too many words. This means you're in the same camp as Barbara Peters. Her biggest complaint about all the books she reads? "Too much middle!" Oh, I read two of her books and the violence and brutality just were too much for me, and I couldn't read any more. But I have seen her speak on TV and I agreed with her opinions and liked her.